For the love of Chloe! L-R are HN’s 1479, 1470, 1498, 1765 and 1956 (missing HN1476). Many of you will be familiar with the more frequently found versions of this popular Harradine damsel Chloe, HN1470 and HN1765, but at the time of her production she was such a popular figure that there were 6 different full size versions of her and a further 3 miniature models. 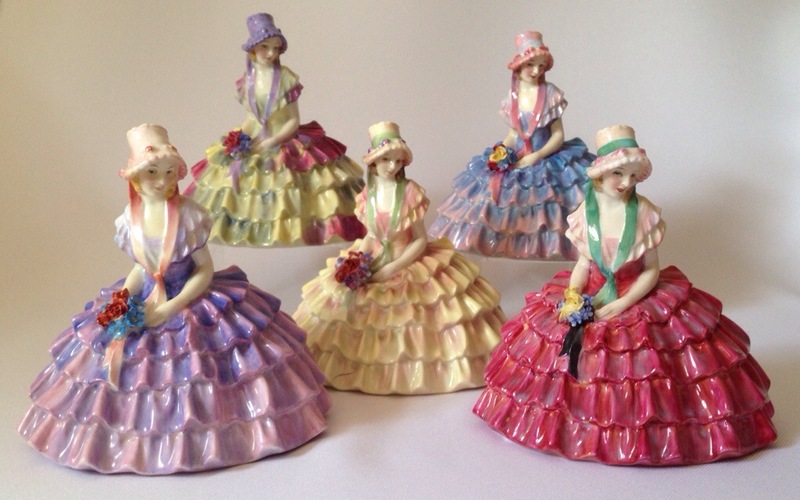 If you refer to the ‘bible’ for figure collectors “Royal Doulton Figures” you will see that 5 of the six are illustrated, the one missing being HN1956, but illustrated here. However, there is another missing colourway. 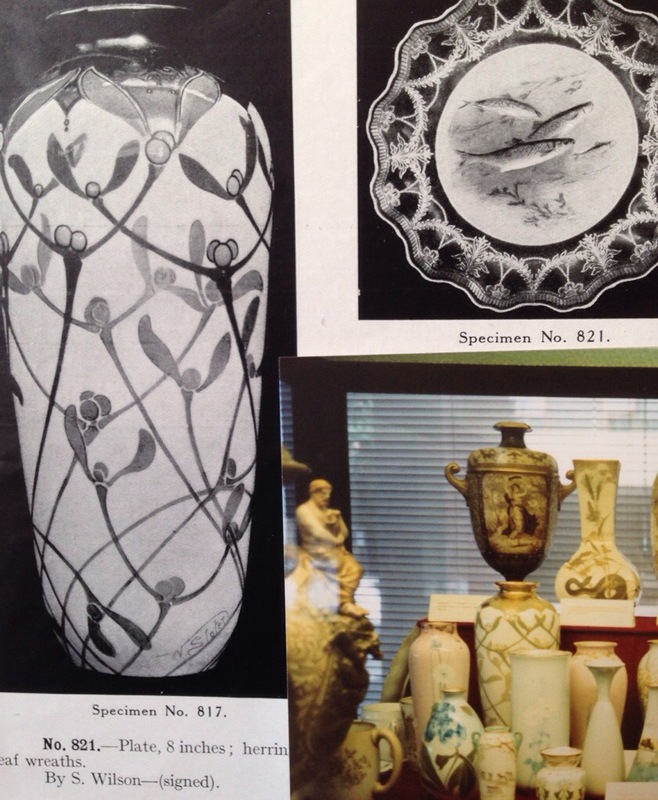 As some of you may have noticed, what is labelled HN1476 in the book is actually a pre-war version of HN1765 – I know this as I bought the figure labelled as 1476 at the first Doulton museum sale. The three M versions of Chloe. 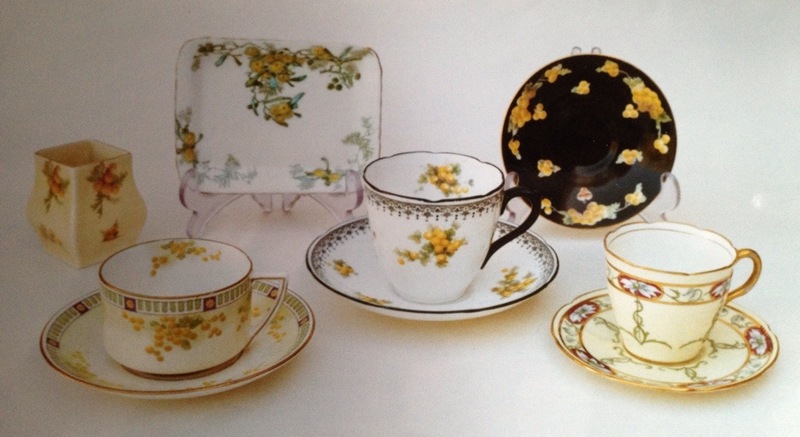 HN1765 was clearly the most popular colourway and production was resumed after WWII. These later models are easily distinguishable as the bouquet is less detailed and indeed smaller, plus the base typically only bares her name as there was no longer a need for her HN number as she was the only Chloe in production at this point. Mistakes do happen and we must remember that the original book was put together using actual figures found at that time. In my experience and as I have previously mentioned the ‘by 1949’ could really be shortened to ‘by 1944′ as production seems to have been halted for all but the absolutely most popular figures before 1944. This small group includes Paisley Shawl HN1392, the Old Balloon Seller, Biddy Penny Farthing, the Orange Lady and the perennial favourites in red of Autumn Breezes and Top o’ the hill. Production of these appears to have stopped in 1944 before resuming full post war production in 1947. M version of Chloe in her original box and packaging from 1932. 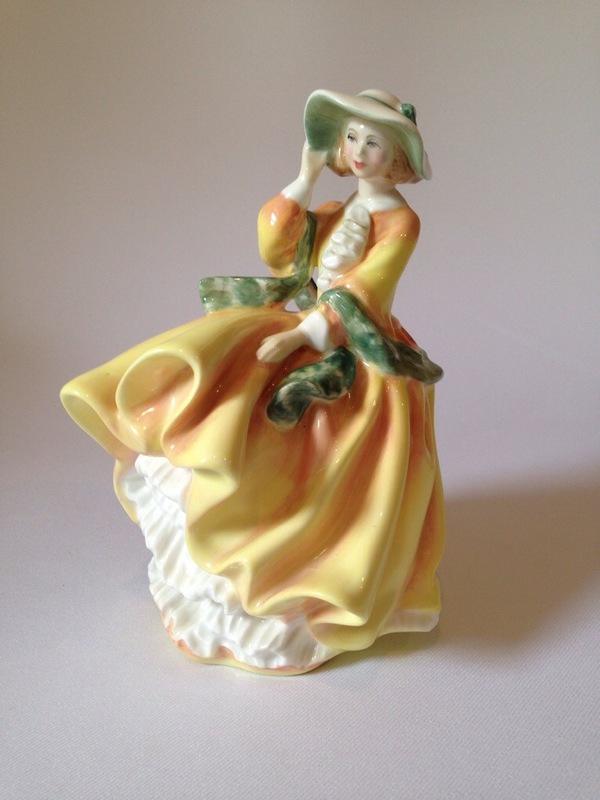 Chloe proved such as popular figure that examples can be found mounted on lamps as below and miniature versions adorn pin trays, calendars and pen holders produced in the 1930’s. Chloe on original lamp base with replacement shade. 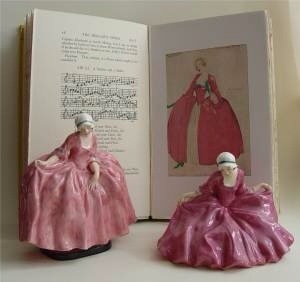 Royal Doulton’s Beggar’s Opera series. 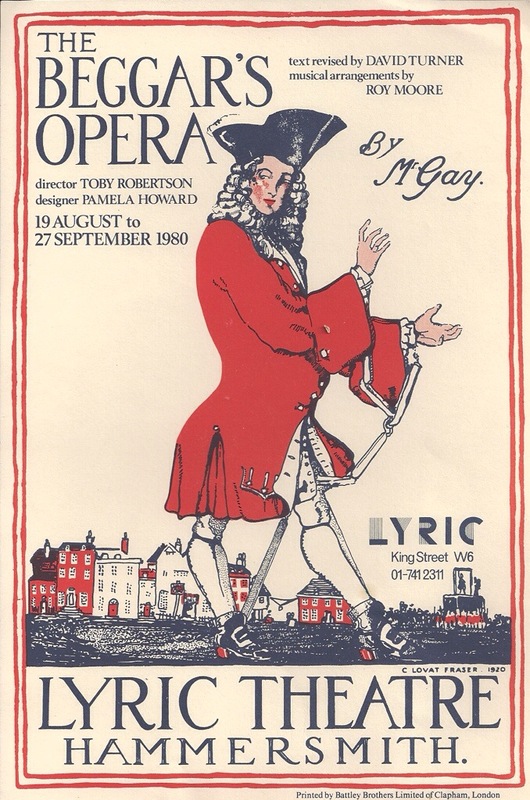 Original poster for the opera. 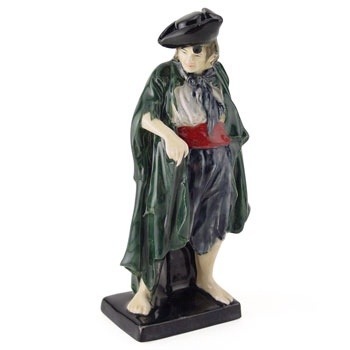 Leslie Harradine as well as establishing a new standard in figure modelling in the early 1920’s, was also responsible for the first set of figures, The Beggar’s Opera Series, inspired by the theatre. Harradine’s figures all closely resemble the costume designs Claude Lovatt Fraser the designer for the revival of this piece at Hammersmith in 1920, as you can see from these pictures in the article. 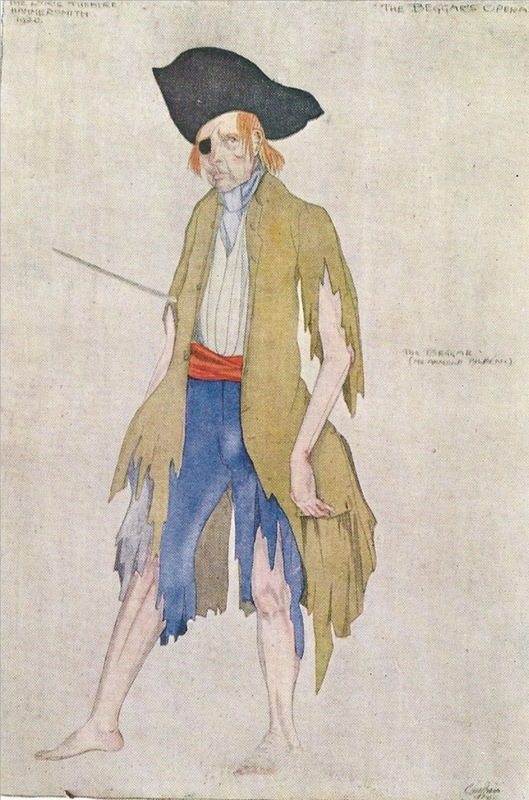 Harradine’s The Beggar and the original sketch for the stage costume. 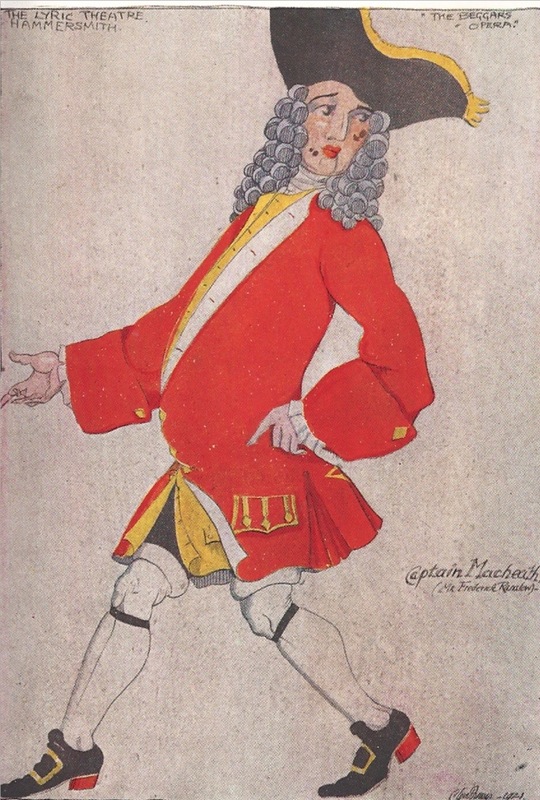 Once made up Lovat’s costumes were thrown to the studio floor and walked on, had paint thrown on them, and where necessary as with the Beggar’s costume, were then slashed and dirtied. He reasoned that the characters from the play were from 18th Century London low life and spent much of their time in jail. Here is the original Captain Macheath figure compared with the original theatre poster and Lovat Fraser’s design. 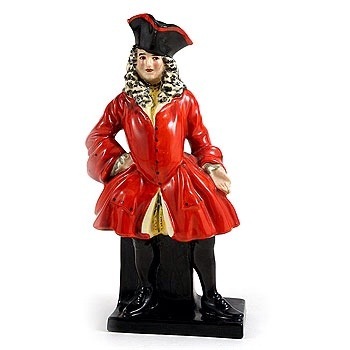 Again the original design and the Doulton figure Captain Macheath. 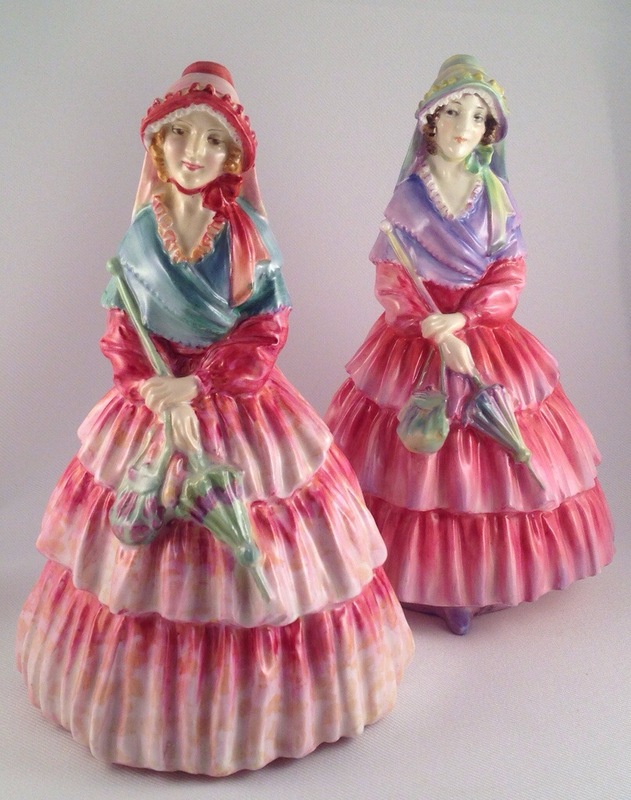 This first series of figures set the tone for future sets by teaming a popular English theme together with an emerging Doulton house style of decoration. 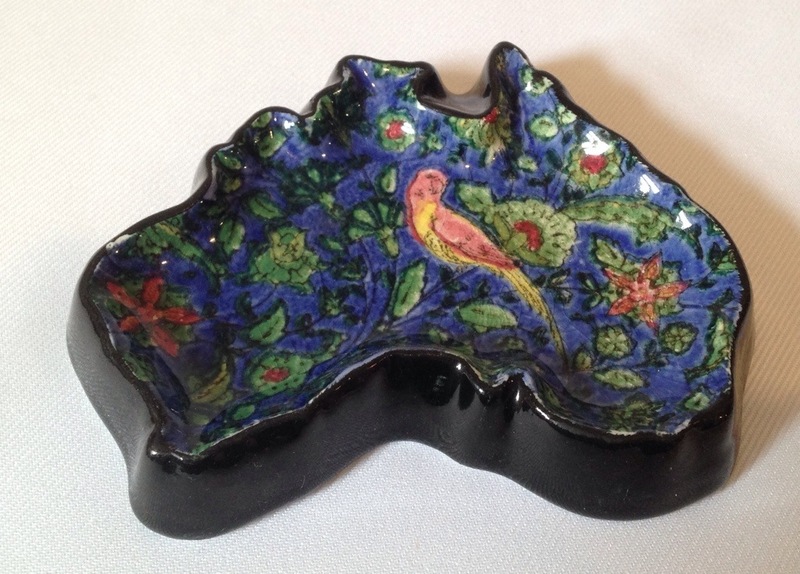 The series proved a huge success and in Doulton’s first official publicity catalogue after WWII, they themselves lament the withdrawal of this popular set! 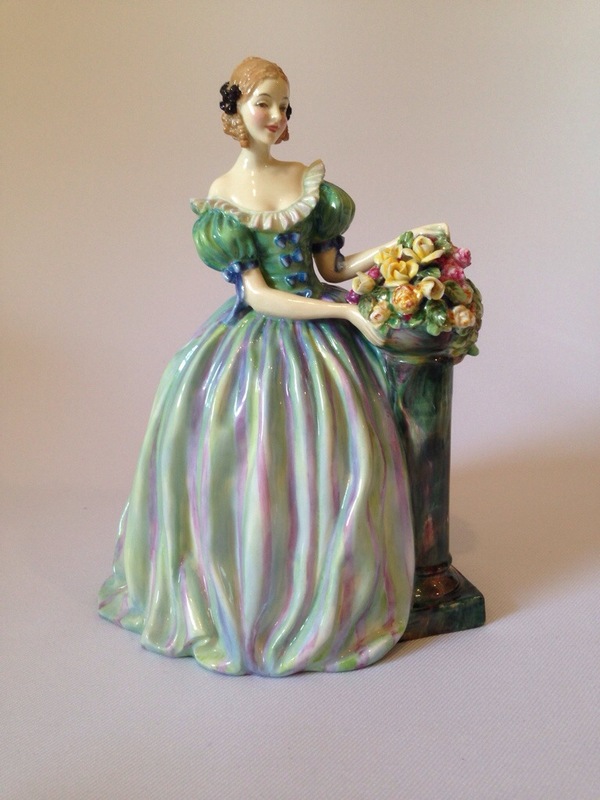 The main female character Polly Peachum is also immortalised in a miniature version, and incidentally more colour variations of this one miniature figure exist than any other! 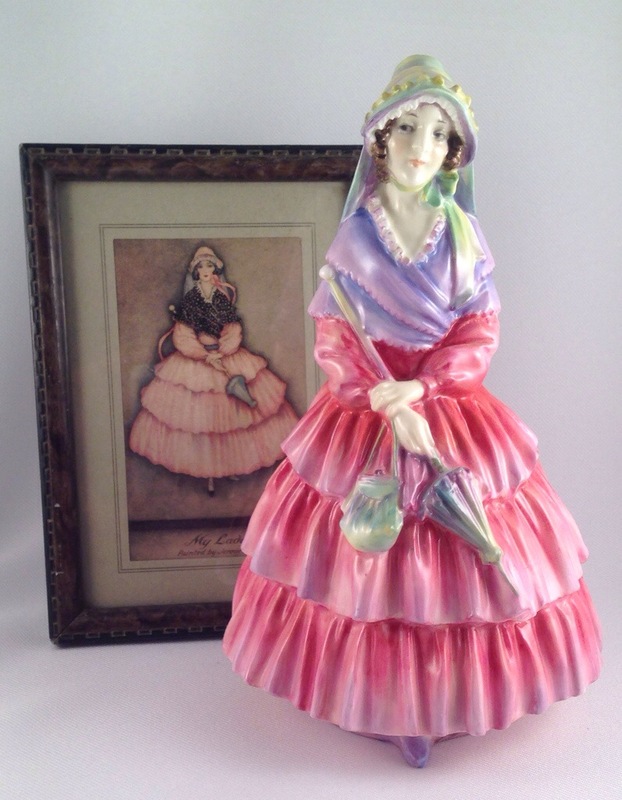 Two versions of Polly Peachum against her original costume design. Incidentally the curtsying Polly was at first called Polly Curtsey. Whether you collect just individual characters from this series or the whole set, they make an eye-catching display! 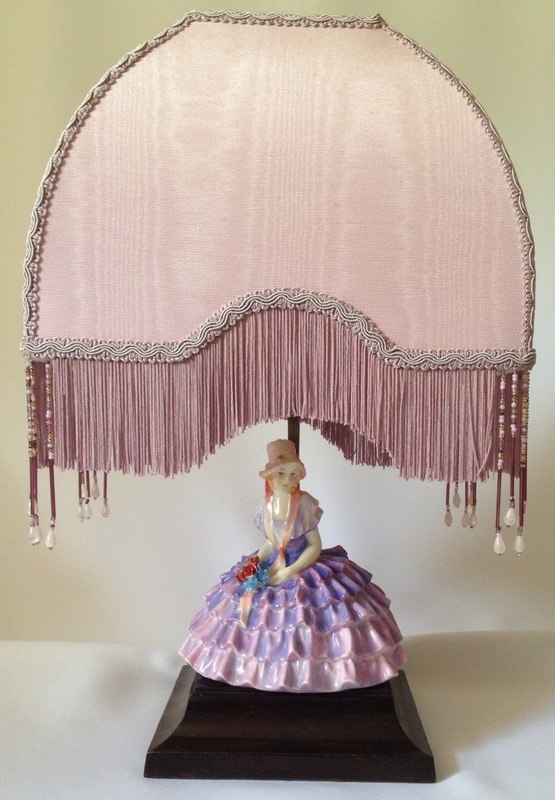 A favourite colourway of mine for Polly Peachum. 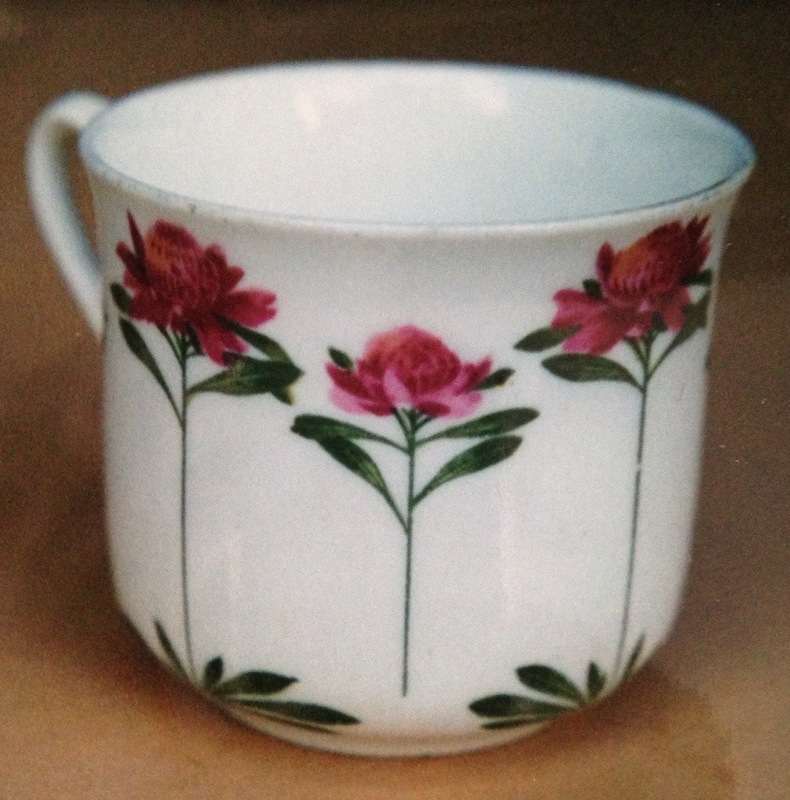 This technique is another unusual ware produced at Burslem in limited quantities around 1930. 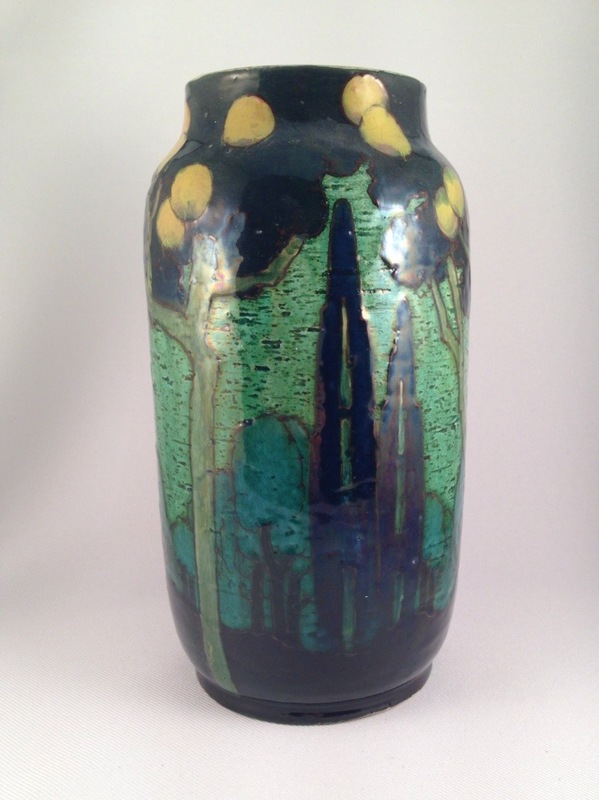 The particular pattern was actually called ‘Moonlight’ according to Fred Moore who also provided an introduction date of 1927 for this design. 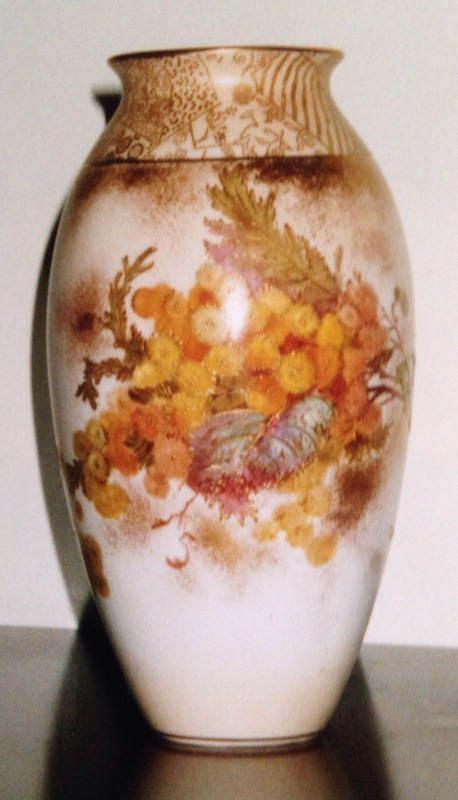 Similar in body to Rembrandt and some Holbein pieces, Barbotine can be found on vases and bowls, plus I have seen a pair of 24″ lamps also in the Moonlight design. Very impressive! 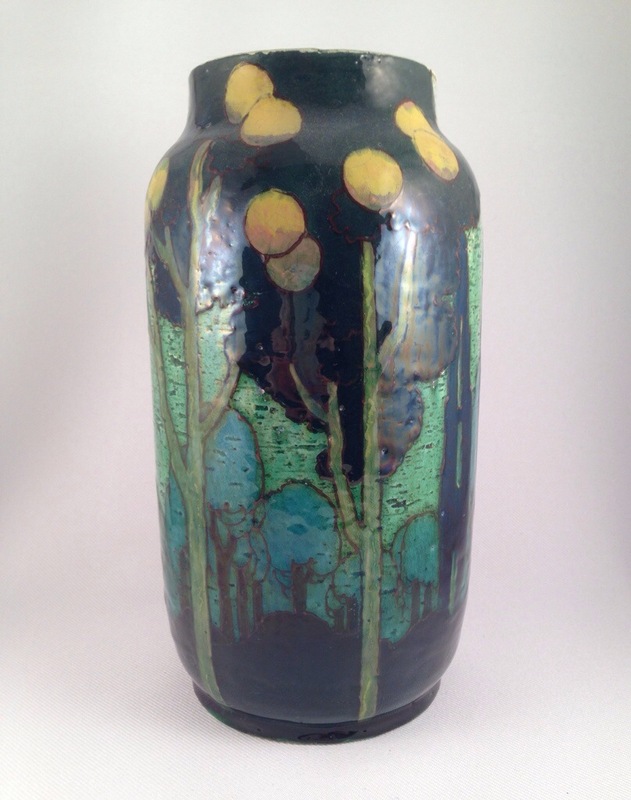 The Moonlight pattern is similar to the drawings of Edmund Dulac, but there are several other designs that have also come to light in the Barbotine technique, yet, they all use the same colour palette of greens and blues with similar stylised designs. I am sure you’ll agree they are stunning pieces! 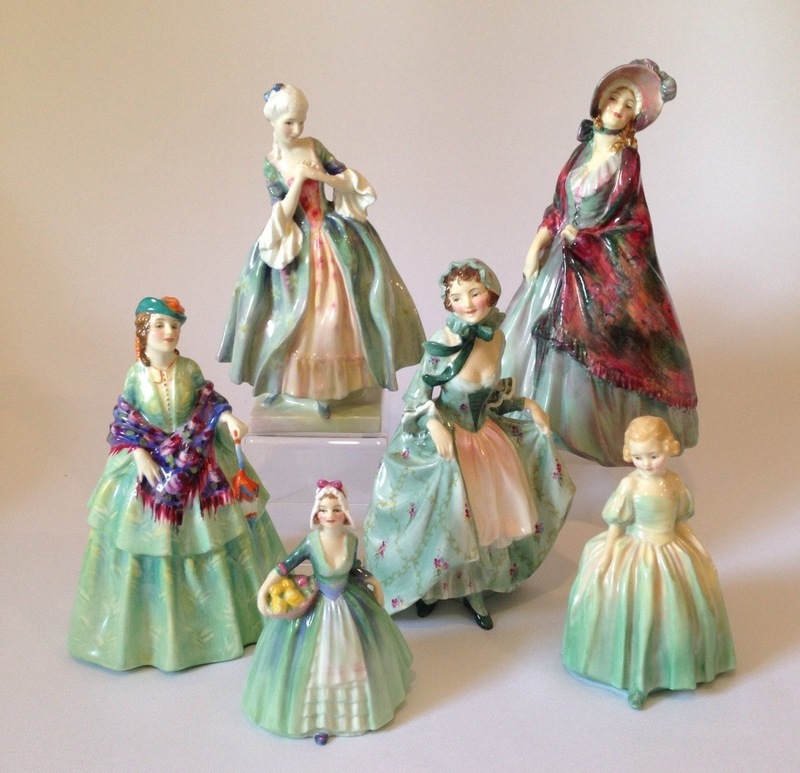 Royal Doulton’s glorious green ladies! 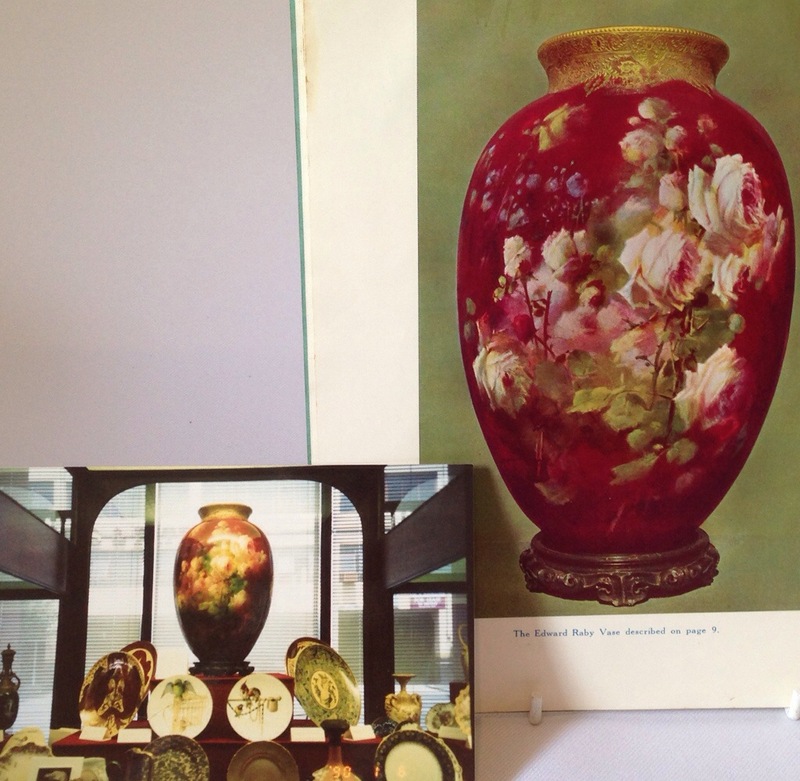 Whilst reds and pinks have remained perennial favourites among collectors, the vogue for producing ‘green’ ladies has come and gone and come and gone again. Yet, those from the 1930’s remain, in my opinion some of the most appealing, not least because of the crispness of the modelling but the detail in the painting too. 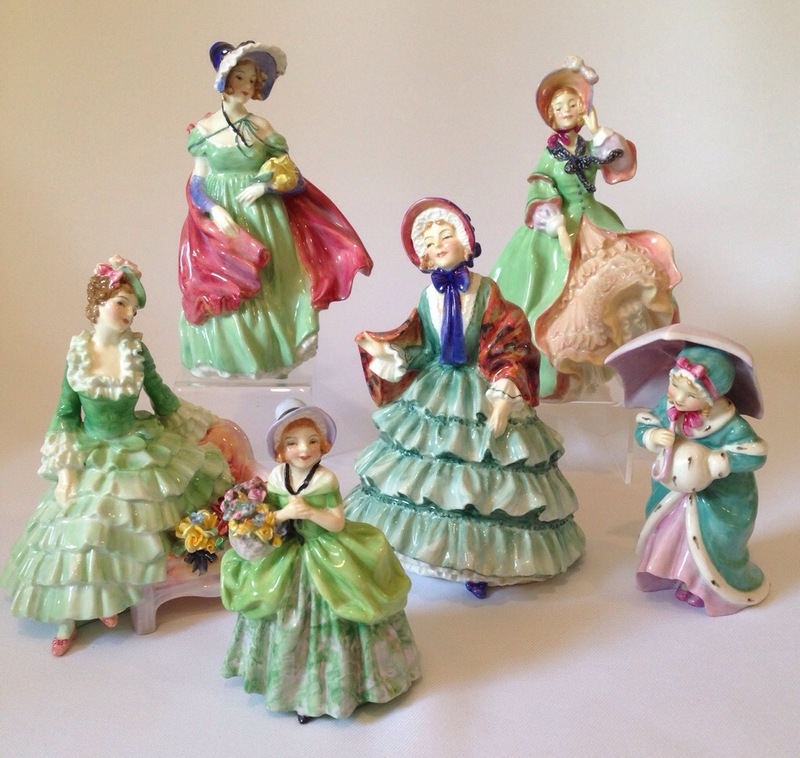 There are so many familiar faces that are so much harder to find in green such as Cissie, Sonia and one that I would love to have in green, Meriel, who remains probably my favourite figure produced. 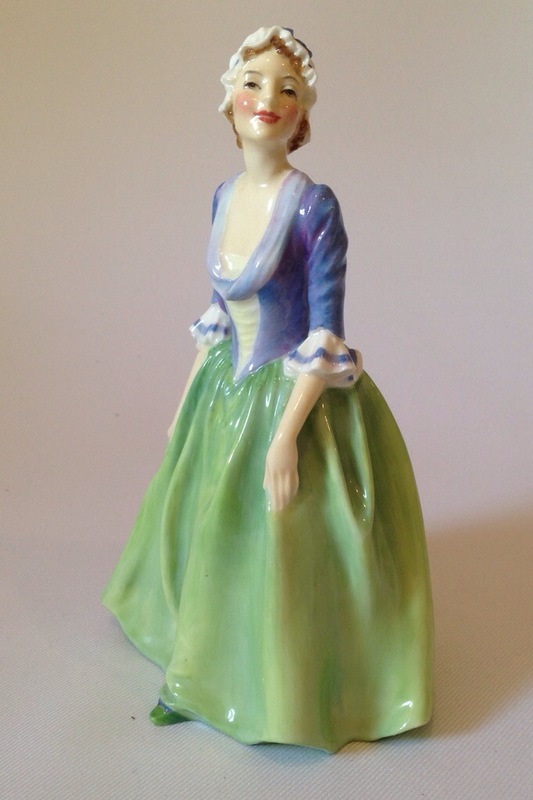 I think part of the reason for the short production runs of these green ladies is the added detail in the colourways, consider Roseanna for example with her stripey skirt. 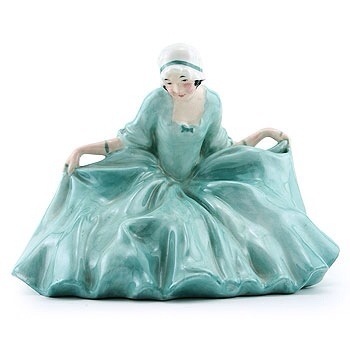 I have a few green colourways and a favourite I have been lucky enough to find is this version of Gwynneth dated 1942 and pictured here. Perhaps you also display your figures according to colour? If so why not share a picture on our Facebook page ‘Doulton Collectors Club’! 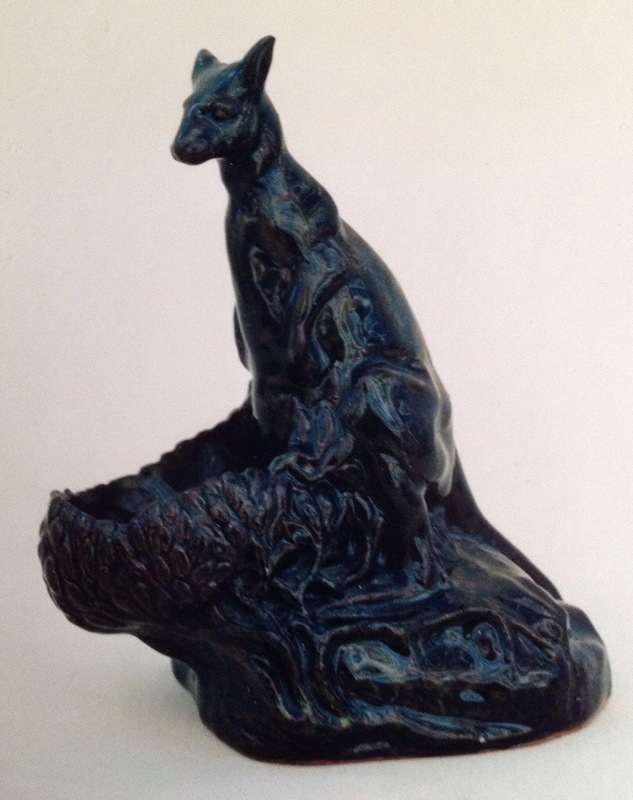 Leslie Harradine we all know was prolific in his output of figure models for Royal Doulton and he took inspiration from all corners of the world around him. 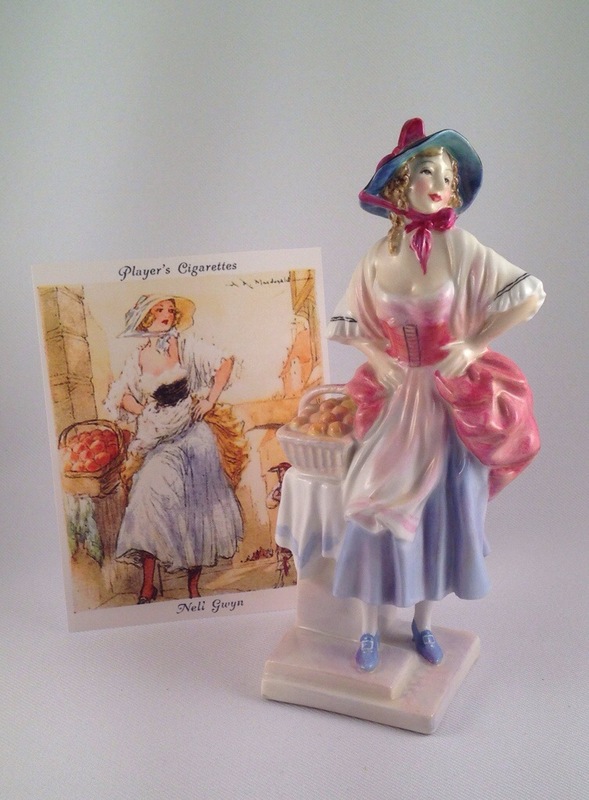 This charming figure of Nell Gwynne is based directly on this Player’s cigarette card from the ‘Famous Beauties’ series dating to the 1930’s. The card in turn is based on the character of the same name who was the mistress of King Charles II, after she caught his eye selling oranges to the audience at the Drury Lane theatre at a performance he also attended. Nell remained a favourite mistress of the King and bore him two children. On his deathbed he is reputed to have asked “let not poor Nellie starve”. 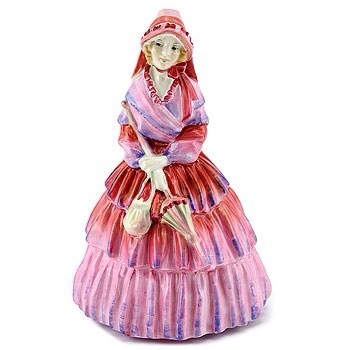 Royal Doulton’s personification of this character fits in perfectly with the many street sellers they also produced. 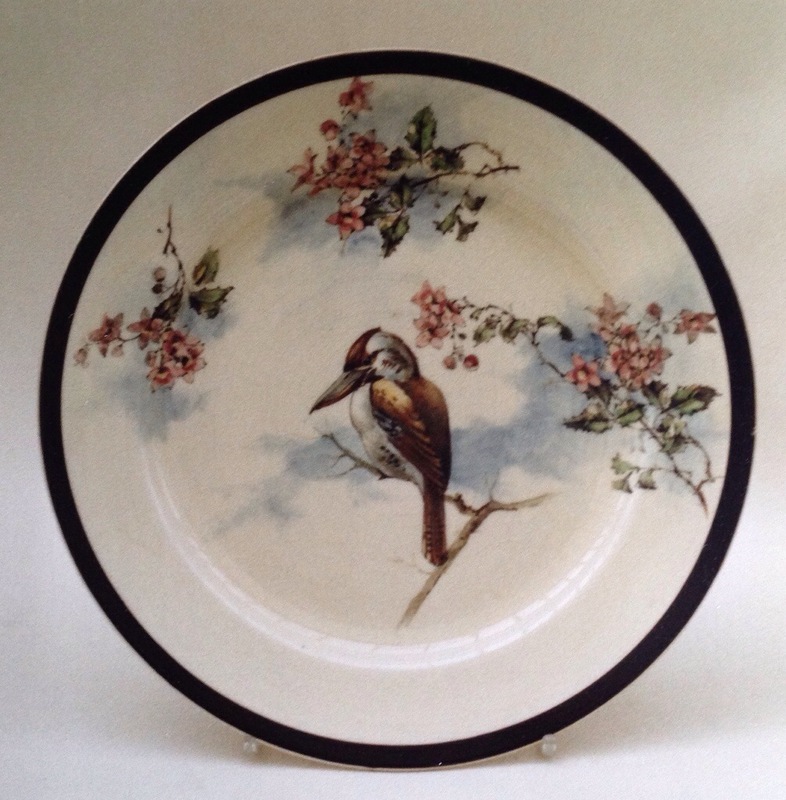 Royal Doulton’s Nell Gwynne HN1887 and the illustration that inspired her.